It's in the middle of the summer holidays, I'm in the process of getting ready to go away for the last two weeks but I quickly wanted to share some of the feedback we've got so far! 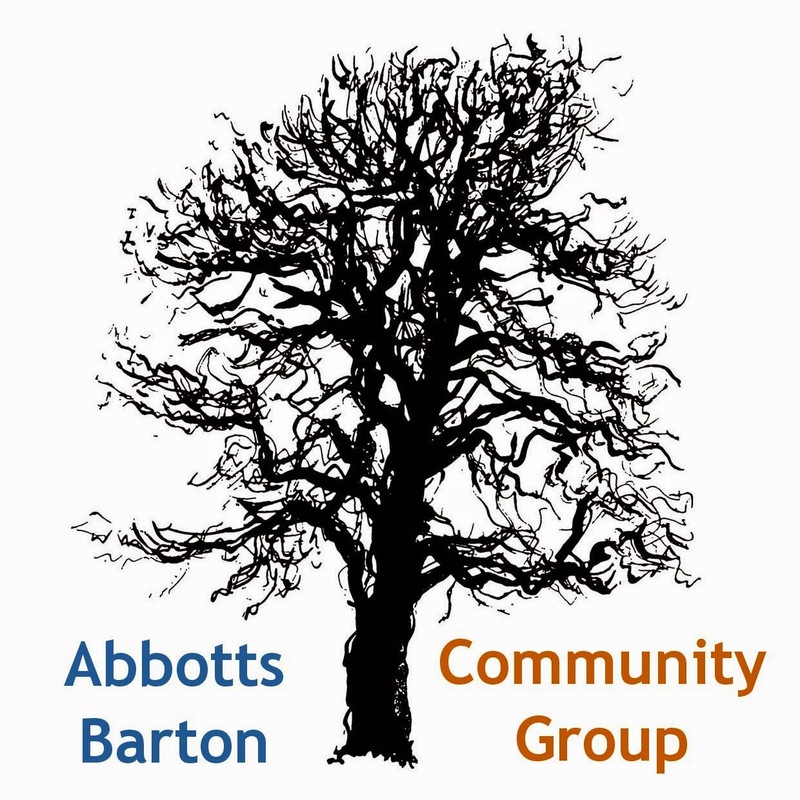 If you haven't actually filled in a version of our questionnaire yet, don't worry, there is still time and we really welcome more feedback from the Abbotts Barton residents: don't forget, the higher the respondent number, the more standing the result has! Please use the link to the online survey on our Community Plan page to let us have your valued opinion. So far we have had 61 responses and 53 of those are from confirmed residents (thank you so much for everybody who gave us some address details). Please note that we are only using the results from people who live in our area of interest. A few of the survey results probably have to be taken with a grain of salt as with some of them it looks as if respondents were rushing and possibly not understanding what they were ticking (seems odd but why else would somebody tick Strongly Disagree on most items, even those that don't seem controversial at all - so I'm wondering if that person didn't read properly and actually thought he or she meant Strongly Agree). But that's OK, there are really only very few of those. The biggest consensus is on the question whether we need a crossing for Worthy Road to make it safer for pedestrians to cross the road: we had 49 people who either ticked Agree (12) or Strongly Agree (37). 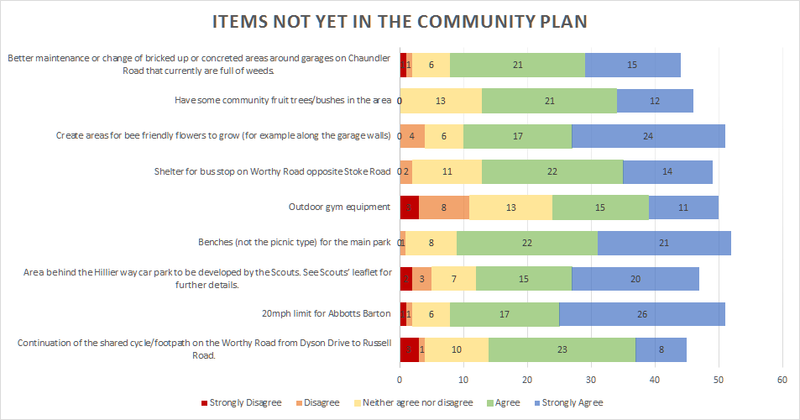 These are the answers for the items that are already in the Community Plan. 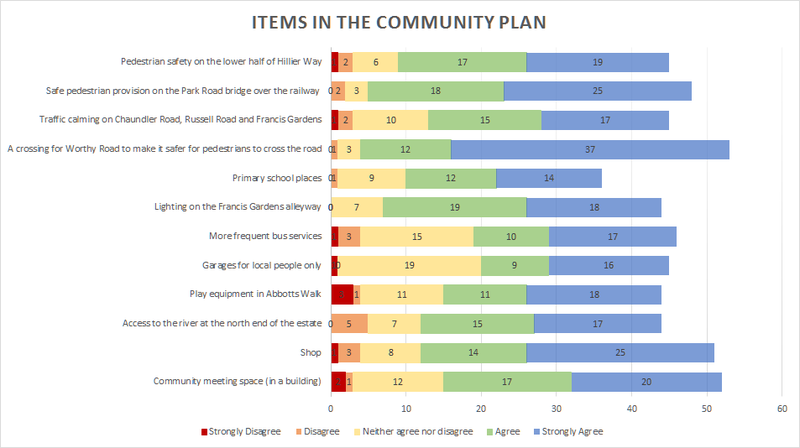 Question: "In your opinion, should the items listed below be part of the community plan for Abbotts Barton?" 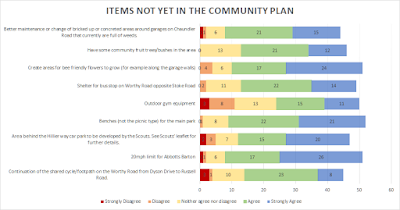 These are the answers for the items that are NOT YET in the Community Plan. 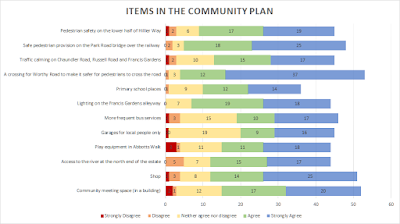 It looks like people are generally happy with the items that have made it already into the plan and that we will add most items if not all that are not yet in there to the plan. We have also received a number of comments which will be collated and presented after the holidays. Before I go, let me take the opportunity to remind you that we are still planning two more picnics in park for this year! Those would be an excellent time to catch Lynne, Jane or myself if you would like to discuss anything with us - but also simply to get to know more people in the neighbourhood! 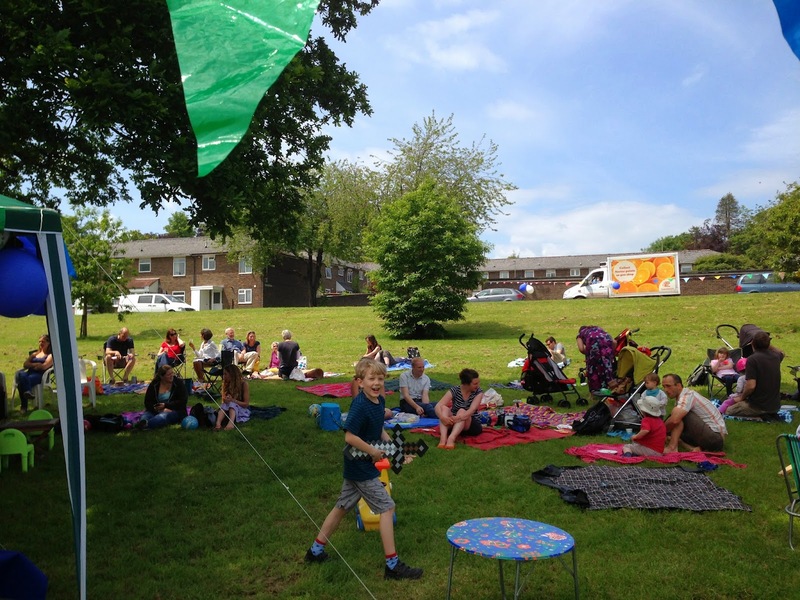 September is also the time when school starts again - so anybody with children starting then, the September picnic would be a good opportunity to meet other local parents.